of note: in the above pattern, all transfers are in the same direction. My test swatches were knit on bulky 260 KM. Held stitches form loops on top of needles brought out to E position. The original stitch formerly in the needle hook grows in length, behind the newly formed loops. When patterning is automated using the tuck cam setting, the non selected needle will not be worked. The original stitch gets longer here as well, while the loops that in the hand technique rest on top of the needles, will now be held in the hook of the needle along with the last knit stitch. 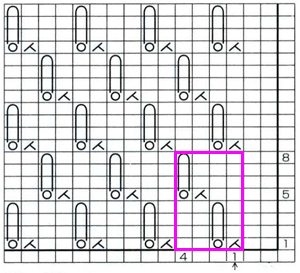 The latter fact is the limiting factor determining the number of rows that may actually be tucked, especially on Japanese machines. Yarn used and needle gauge also matter. Tucked fabrics, like lace, need to be weighted evenly for loops formed to knit off properly. When transfers are made in a single direction, the fabric will bias in the direction of those transfers. In the bottom section of the photo below, the resulting lean to the left is easily seen. If a bias leaning fabric is desired, this is an easy way to get there. 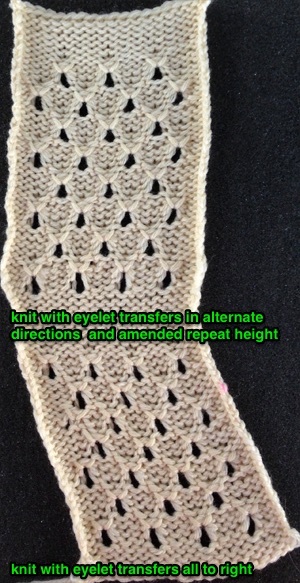 However, if the goal is to achieve a balanced fabric, then the transfers need to happen in opposite directions as seen in the top segment of the swatch. 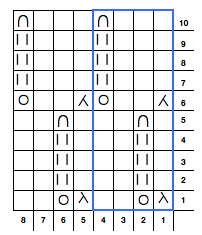 the number of held/tuck stitch rows has been changed to 4 rather than 3. 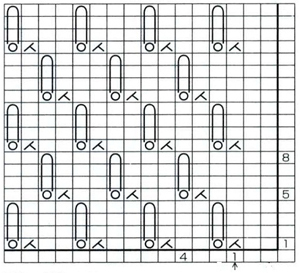 When the row that knits off the loops occurs, the total number of knit rows for the sequence will be an odd one, resulting in the carriage being at opposite sides of the needle bed at the end of each pattern repeat. 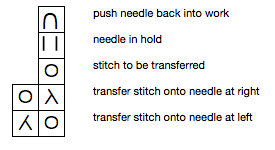 Transferring stitches may then be made toward the carriage: COR – transfer to right, COL transfer to left. This makes it easier to track direction when working the fabric as a hand technique. Next up: automating the pattern for standard gauge machines using the lace carriage, and tuck patterning in the knit carriage as well.